The other day I was feeling like our Yahoo! list was getting a little boring. It's been two years, and what was once a vital, dynamic group had gotten quiet and lack-luster. So, I wrote a note asking the listmates what they'd like to differently. Wow! What a group! There has so much activity on there the last couple of days that it is overwhelming. On top of that, it seems to have energized me to hear from so many people. The boxes of stuff left over from the Farm Show got moved around and some were even put away. I ran the vacuum, got out of the house, did laundry, and even put a little BB King on the cd player. That might not sound like much, but this virus had been sucking the life out of me. Two weeks now, and it is still clinging to me like a stench. It was very gratifying to know that so many people were in about the same place I was. All we needed was a little poke to wake us up. I'm sure it will quiet down again somewhat until our gardens start doing what they do, but I'm relieved to know they still care. g I have been quiet and learning a lot from everyone. What I do to beat the winter blahs otherwise known as Winter Blues - last year I enrolled in a "Life Writing" class which started the first week in January. I am still taking the class. It is for seniors and quite informal. Not tests, no studying, just writing and enjoying life. I won't be taking the spring and summer class 2006. We have a greenhouse business and we start growing in mid Feb. and along about Mid March, we are out there for several hours each and every day. I did take the class last spring quarter and it got a bit hectic in May. What I did before this new adventure was to find something completely different from what I had been doing the other 3 seasons of the year. I have yet to try tatting. It has been on the list for more years than I care to remember. Many winters ago was my soap making project and it has stuck with me ever since. Make goat milk soap and the tallow which I render out from our freezer beef. These things keep me from thinking that it is winter as I am too busy to think about it. That is until I have to go out and feed the goats and haul warm water to them. We still don't have electricity to their barn (we moved here in '01) so that has not been a priority. It gets me out there to check on them at least 3 times a day to make sure they have good water. It gives Duke (dog) time to get the "stink blown off" too as he goes out with me to check on the goats plus check the area for messages (just in case other dogs left any as they came wandering by). I may have snow on my roof but I won't admit to being old. I try to learn something new all the time. g I lived in England for 4 years and never had a problem with Seasonal Affective Disorder until the last year there. Once out of the area, it resolved. But come February in the Northeast, we all have cabin fever. Lemon balm tea has a very uplifting quality to it. We mix it with chamomile in our Gentle Soother tea for an excellent blend for its relaxing, yet light anti-depressant qualities. Sunny Days Room Spray is another product we make, but you can make your own with select essential oils. Choose EO's such as lemon, basil, grapefruit, etc. These have been shown to affect mood. Sit in front of a full spectrum light. Make sure the light hits your forehead, so the pineal gland is stimulated. You may have to remove the lampshade for this. There are lightbulbs available in most supermarkets that have full spectrum light in the $5-7 price range. Move around! The rhythms of winter make us want to hibernate. However, it will help depression if you participate in some sort of movement - tai chi, yoga, or brisk walks in the winter sun. St. John's wort tincture is a time-proven help for SAD. However, do not mix it with pharmaceutical anti-depressants unless under a qualified health care practitioner's guidance. Try Albizzia tincture. More and more research is showing Albizzia to be "the happiness herb". Most herbs for depression bring someone to a flat affect. Albizzia actually helps promote lightheartedness and happiness. Create with herbs. Winter is a wonderful time to test new herbal recipes, try a new herbal craft, or plan spring's herb garden! When I've had enough of New York snow and I'm craving green things, I like to plant a handful of wheatgrass seeds in a large flowerpot. As the grass grows at an amazing pace, I enjoy "mowing" this lawn with scissors. It feels like summertime in my window. And hey, the wheatgrass clippings are nutritious, too! Keeping the winter blues away is not always an easy thing for me. My husband has always worked a night shift, and although I have a child at home, there is nothing like having another adult to talk to in the evenings. So, I try to make it a point to get together with a friend one evening, at least every other week, and I love to sit and chat and drink herbal tea. One of my favorite teas is Citrus Green Tea, which is high in Vitamin C and antioxidants. Mix together and store in a glass jar. Use 1 tea ball per cup of tea. I do a lot of crocheting in the winter. Last year I made 2 afghans. It's my slow time. I like to rethink my business, experiment with new ideas, and get ready for upcoming summer shows... and get those taxes done. Seems like I have very little time for the blues. I seem to be just as busy in the winter as in the summer. I need to find time to relax, rather than have too much time on my hands. The snow doesn't effect me like others. It is very beautiful. I just don't like the cold. We feed the birds in the winter, and I like watching them at the feeder. As for herbs, I cook with them, have a cup or 2 of herb tea in the evening and use them in my products. Microwave cider with teabag in it. Let steep for a few minutes, and add honey to taste. If you can find it, a cinnamon-flavored honey is divine in this! Brew tea to your liking. Add 1/2 tsp. lemon balm hydrosol, and honey to taste. Very mellow and relaxing. My winter blues chaser will be much different this year than in years past. During the past 5 years the greenhouses were always empty of plants until about Feb or March, so there wasn't much to be done. I would usually grow a few plants or start seeds under grow lights in January just to have something "green" to do. This year however, it is going to be much different. Both greenhouses are full of plants that will have to be nurtured and groomed all winter. Heaters and water pipes will have to be maintained along with seedlings and baby plants. Nothing like spending a cold January day in a warm and toasty greenhouse full of herbs and scented geraniums! There are a couple more I'll add tomorrow. We get such great ideas from the readers and writers of the magazine! The Essential Herbal has a special feature each issue where we ask a question of our readers, and publish the response. In the Jan/Feb '06 issue of The Essential Herbal, we asked for "favorite ways to deal with the winter blues." Melt the shea butter over low heat (a double boiler is great for this). Once melted, slowly add the sweet almond oil. Mix well. Remove from heat and cool slightly. Not too much, it should still stay in liquid form. Add a small amount of colorant and mix well. Add more color if desired. Add fragrance and mix well. Pour into molds. I like to use candy molds for this, but you can use ice cube trays. Cool in the refrigerator for about 15 minutes. At htis point they are ready to use. Just pop them out of the molds. Dissolve the melts in running water and enjoy! gI can't think ov anything better than baking a fresh loaf of my Grandma's Cottage Cheese Dilly Bread to kick the winter blues (or any blues). It seems that food - especially bread - is so comforting. A pot of homemade soup with this bread is unbelievable! I just made it recently with some freshly dried dillseed from our garden. Mix yeast and warm water. Mix first 8 ingredients well with a mixer and add yeast mixture. Begin adding flour and knead. Cover and let rise until doubled. Punch down and divide into pans. Don't overfill pans - this bread rises more while baking. Bake at 350 for 30-40 minutes - less for smaller pans. gI keep away the winter blues by planning next year's garden and projects. Every year I try to do one new thing in the garden... add a fence, plant blueberries, add an herb bed, etc. All year long I go through my garden books and tear out the pictures I like, and tuck them away in a folder, waiting to be pulled out for planning during the cold winter months. This year I want to "scrapbook" next year's garden with pictures of outbuildings I want, yard art, and flowers/herbs to plant. I am going to have before and after pictures. These pictures were taken last Friday before winter arrived. It has since turned very cold - our "normal" weather is finally here. I've been reading about the mid-west and south-west with snow and ice, and a friend in Los Angeles wrote about the freezing temps and not having heat in her house! By that, I mean there is no system for heating her house to begin with, not that the power is out. Then there were the 118 mph winds across Europe... a very strange January indeed. The buds in the picture are from an ornamental cherry tree. Tiny leaves are formed and WERE ready to unfurl. The freezing weather will tuck the tree back into hibernation, and it will re-bud in the spring. I took a walk around to see what else was going on. The rosemary was also getting ready to bloom, and I have no idea what will happen with that. There was lots of plantain and dandelion out there, and as you can see, the lawn has not turned brown yet. It is now covered with a very thin layer of snow. Miss Molly turned 16 the other day. I can't believe it. I was secretly hoping that she wouldn't be itching to get her driver's license, but no... that is on her to-do list. What a fast 16 years that was! She no longer thinks I know everything. In fact, I barely know anything! Thank goodness she's patient with me in my dodderage. She's still a kid enough to be tickled with penguins on the cake, and she scooped up the candles as a keepsake. As a salute to her "herbal heritage" she requested pasta with pesto for her birthday dinner. I snuck some of the chickweed into the pesto because I just couldn't resist all of that lush growth outside. Lots of basil and garlic, with just a handful of chickweed. The adults were suspicious, but cousin Rob liked it. He even asked for instructions so he could make it himself. It came as no surprise to find myself coming down with a bug. I was run-down, had talked to thousands of people, and was sitting in a draft for a week. The first thing was to start on echinacea and elderberry tinctures. After a couple of days the congestion moved into the chest, and it is now starting to clear. In the meantime, Molly started out with a stomach bug. I dropped a slice of crystallized ginger into her cup of herbal tea to settle her tummy. As she felt better, she started to munch on some baby carrots, and they really helped. I have no idea why they work, and haven't read up on it. All I know is that when I am feeling indigestion or heartburn, 4 or 5 of those small carrots make a bigger difference than an antacid would. Could it be the saliva? Maybe it just gives the stomach something more interesting to do than annoy me. In any case, it works for us. She seemed a little sniffly yesterday, so now she's on the echinacea/elderberry. We might add a little nettle tincture. We also stocked up on fruit and vegetable juices. We've been eating lots of good, fresh food and staying away from junk. There are so many nasty bugs around right now - probably made worse by the lack of freezing weather. All we can do is wash our hands frequently, avoid crowds, eat well, rest well, and hope for the best. Keep the herbal preparations that you know and use on hand. Drink lots of liquids, and be vigilant. Stopping them before they get a good hold on you is the best defense. At first I was going to write about this stupid bug that has me feeling listless. After breathing in who-knows-what for a whole week, I got pretty sick. Regular dosing of elderberry and echinacea seem to have knocked the bug out (well, almost - cough, cough), leaving me confused as to whether I'm sick or just still exhausted. I like to know what to blame things on. Now Molly's home sick too. But then I got to thinking about the word "listless". Of all the descriptions of what life is like right now, listless would not do. There are lists everywhere! There is a list of people we need to follow up with from last week. The list for the grocery store. The list of orders that need to be packed for the post office. The list of bills that have been patiently waiting their turn. The list of small but important details that need to go into the magazine. The list to prepare for Molly's 16th birthday on Friday(!!!). The emails I haven't gotten around to answering from last week. Oh. See? It's a compulsion, but I am certainly not listless! The 91st PA Farm Show is finally history, and I am home, sweet home. All business aside, I have never been so exhausted in my life. Between the poor air quality (we shared the air with 1000's of animals and humans), noise levels, open doors to the outside chill, and food, it was a tough week. We met a lot of wonderful people, though. Our favorite new friend is Dennie Huber. He is a balloon artist, and he kept the under-18 crowd happy. He is also one of the nicest men in the world. Sitting from 9 until 6 each day, pumping out thousands of balloon creations, this guy never lost his cool. Even when a child lost his lunch on Dennie's shoes, he kept smiling and twisting, never missing a beat. He was inspirational. There were all sorts of sights and sounds that I will never forget. 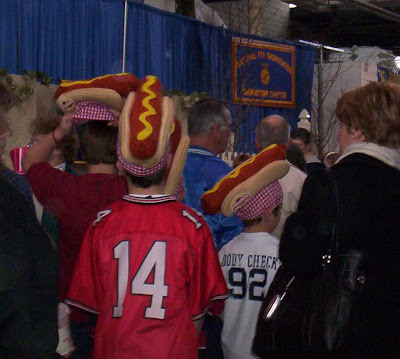 One in particular was the groups of kids wearing hats that look like hotdogs. 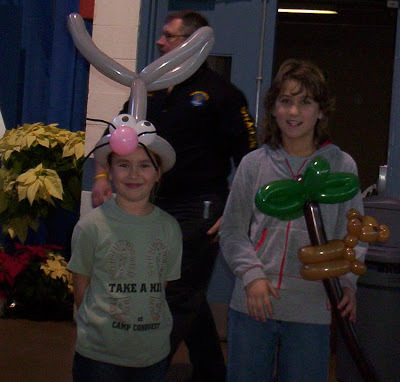 There were also animal masks, balloon hats, and - this one really cracked me up - people willingly wearing the hats they used to make us wear when we worked food service. The chickens and pigs were one hallway over, and in the morning those guys sure could make a racket! There were lots of informational booths, and one that I found particularly interesting was the gourd booth. They gave us some packets of seeds, but we won't find out what they are until summer. The kids came up and took care of the booth for us while we did our first soapmaking demonstration. They thought it was kind of fun. They were only there a little over an hour. All in all, it was an experience to remember. We met people from all over the world, and discovered that the making of biodiesel fuel is the real reason lye has become more difficult to obtain for the home soaper. Making biodiesel is very similar to soapmaking, and the makers of lye most likely see the packaging of small amounts as a poor business decision. Not meth labs, not terrorists, but fuel. And now, we return to our regularly scheduled life. We are having a pretty good time, taking pictures and writing down some of the funnier things people are saying to us. The crowds are enormous, and last night I stepped outside for a moment for a breath of fresh air (I heard there was snow, and wanted to see!). The silence that fell when the door closed was just amazing. Being inside all the time, I wasn't aware of the din. There is a constant roar of human voices made up of thousands of people talking. Sitting in our corner booth, we are seeing some funny stuff, and talking to some interesting people. I'll get back to you! the moon was rising in front of the house, over the neighbor's. At the same time, the sun was setting to the back, and was at almost the exact same level in the sky. There isn't a day that passes without some vision outside to pause and watch. The other day it was a flock of bluebirds. I haven't seen the bluebirds for years. When Mom first moved into this house, they were always around, perching on the tips of the pine trees. She loved them. It seemed fortuitous to see them on New Year's Day, back on their posts. Most of the last month or two has been spent getting stocked for the upcoming show. It feels like there has been nothing else - but of course that isn't true. In fact, today I am going to be working at Radiance while Sarah grabs a quick visit with her sister. I sometimes talk about the people at "my" post office. This is a picture of Paul. He just found out that his new uniforms have arrived and that he will not have to wear ties anymore. The gang at this post office is hilarious. Entering the office, there is the outer room with the locked boxes. Behind the boxes I often hear laughter and singing from the workers. You open a second door to get to the windows to buy postage. They pop around the wall, always grinning, always willing to include the customer in whatever happiness is going on. Now working on the magazine fulltime, the postal workers are some of the people I see the most, and they are almost like co-workers in my mind. This guy here... well, he has the most infectious mix of professionalism, knowledge, and high spirits ever to grace a counter. Well - time to start another day. Let's see what this one brings!